Exmoor National park is 267 square miles of open moorland, vivid with purple heather in summer. An ancient landscape with wooded oak valleys, arable farmland with historic beech hedges and dramatic coastline. Hundreds of miles of track, bridleway and country roads make Exmoor a hikers, cyclists and horse riders paradise. 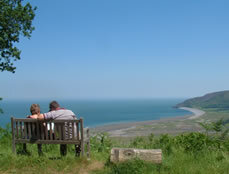 You will enjoy sweeping views across the rolling hills of Somerset and Devon. Get close to nature with herds of wild red deer and Exmoor ponies. Plenty of attractions, heritage and events throughout the year to choose from. Excellent quality food and drink much made from local Exmoor produce. Charming villages and towns to explore. Begin your journey at Watchet Station on the West Somerset Steam Railway on 2 minutes walk from Croft Self Catering Cottages.